Tomorrow I'll begin onsite coverage of the USTA Girls 18s Clay Courts in Memphis, with the seeds taking the courts for their first matches, after receiving first round byes. The Tennis Recruiting Network has published their predictions for all the Clay Court Championships here. 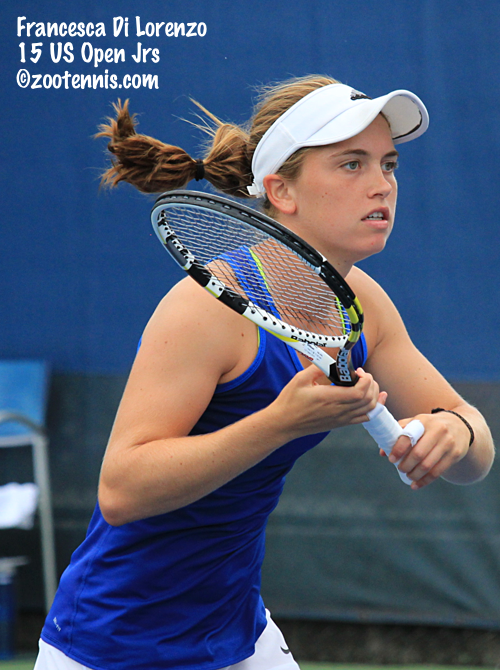 Francesca Di Lorenzo, who finished her freshman year at Ohio State ranked fourth in the nation, won the singles and doubles titles today at the $25,000 ITF Women's Circuit event in Winnipeg Canada. The 18-year-old from Ohio defeated fellow qualifier Erin Routliffe of Canada 6-4, 6-1 in the singles final, winning all six of her matches (one qualifying, five main draw) in straight sets while never facing a seed. Di Lorenzo had won a $10,000 Pro Circuit event last summer, but this is her first title at the $25,000 level. Di Lorenzo and Ronit Yurovsky, the rare Ohio State - Michigan pairing, won then proceeded to claim the doubles title, beating Charlotte Robillard-Millette and Marie-Alexandre Leduc of Canada 1-6, 7-5, 10-6. It is the first pro level doubles title for both, and the first Pro Circuit title for recent Michigan graduate Yurovsky, 22. At the ITF Grade 4 Flower Bulb Tournament in the Netherlands, 17-year-old Miranda Ramirez swept the singles and doubles titles. Ramirez, who won two Grade 5 titles back in 2013, was the top seed in the tournament. She defeated No. 3 seed Maria Manilova of Russia 4-6, 6-4, 6-1 in the singles final and teamed with Daevenia Achong of the Netherlands to take the doubles title. Achong and Ramirez, the No. 4 seeds, defeated Irina Babkova and Manilova of Russia 6-3, 6-1 in the final. Qualifying is complete at the Citi Open, with Ernesto Escobedo earning a place in the main draw by defeating Dennis Novikov 7-6(3), 6-4. Jared Donaldson beat Marinko Matosevic of Australia 7-6(9), 6-4 to advance to the main draw, and Ryan Harrison and Alex Kuznetsov also earned their places in the main draw via qualifying. Lauren Albanese, who lost in the second round of the Winnipeg tournament, qualified for the women's main draw by defeating Shuko Aoyama of Japan 7-5, 6-1. At the Bank of the West Classic in Stanford, Sachia Vickery and Asia Muhammad qualified for the main draw, with Vickery defeating Taylor Townsend 6-2, 6-2 and Muhammad downing Julia Glushko of Israel 6-2, 6-3. After taking a 2-0 lead on Friday in their Davis Cup tie with Croatia, the United States couldn't find that final point, with the Bryans losing in doubles on Saturday to Marin Cilic and Ivan Dodig and John Isner and Jack Sock falling in singles to Cilic and Borna Coric today in Portland, Oregon. Croatia will play France in the semifinals, which are the week after the US Open. For more on today's matches, see this AP article. When is the last time we had a 2-0 lead at home and lost the tie? Not sure. Last time the US was up 2-0 and lost was 1996, but that was in Sweden. Hopefully Sock learned a valuable lesson from being manhandled in the deciding tie and next match check his mega-ego in at the door. Agree on Sock. He is a nut case and needs a full time mental coach, but has to be accepting of changing his attitude, which I doubt he can do. Unpleasant to watch, and I had that misfortune.